I am gullible. Very. I betcha I am more gullible than you. And that tells you something, because you know how gullible you are. Or so you think. See, because of my gullibility, I’ve decided that if I’m to have any idea of what really goes on around me, I’m condemned to reading a lot. If these two people have actually been poisoned, that’s a really terrible thing. But maybe lying about such things is much worse. And I doubt that anything at all we’ve been told about the Skripal case is true. Not because I don’t want to believe it, but because the storytellers plant so many trees they’re getting lost in their own forest. 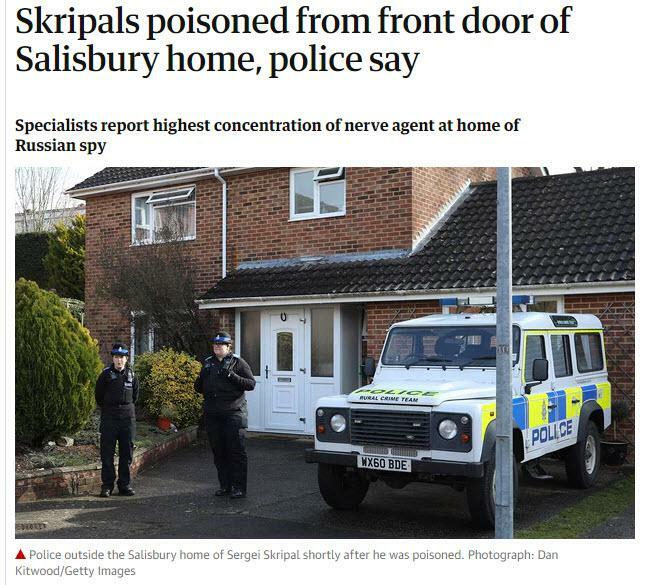 Today the British press reports that the Skripal father and daughter pair were poisoned “from their front door”. They do that with the same level of certainty that just a few days ago they used in telling us they were poisoned through the air vents of the dad’s BMW. Exact same story, just a different location. And that’s after a by now long sequence of headlines that claimed it had happened inside the home, or in a bar, a pizzeria, or on the parkbench they were ostensibly ‘found’ on. What that headline above, and all others on the topic that came before it, tells me is that evidently the hundreds of ‘experts’ involved in the case have not yet been able to locate the ‘nerve agent’. They’re still just guessing, even 25 days after the incident is supposed to have happened. How would that be done? I have no idea, but I’m surely thinking that after almost 4 weeks it’s essentially a pure guessing game, and nothing more than that. Does the alleged nerve agent leave traces after all that time? I don’t have a clue, but I do know from what I’ve read that it’s apparently so toxic (as in lethal) that even very faint traces of the stuff are, well, lethal. So when I first read the BMW air vent theory last week I was thinking: did the guy who towed that car to the police station wear a full hazmat suit? He would have had to if he’s still alive. And where is that car anyway? Come to think of it, where are the Skripals? And how is it possible that they survived the ‘attack’? Were they given a full blood transfusion? Are they being treated 24/7 by dedicated personnel in hazmat suits? There are too many questions for me to answer. And that goes for you too. And for Boris Johnson. And Donald Trump. And the governments of the 30-or-so nations that nevertheless expelled well over a hundred Russian diplomats. Now, I’m not a chemist, let alone an organic chemist. So perhaps I should consult with my friend Dave Collum, who is. But I was going to write this from memory, not go back and find all those headlines, or ask around. This is not about me being 100% correct, it’s about the ‘news reports’ being so far off the truth. Here’s what I have picked up about the nerve agent. The press calls it “Novichok“ (Russian for newbies), but Novichok is not a nerve agent, it’s a group of them. 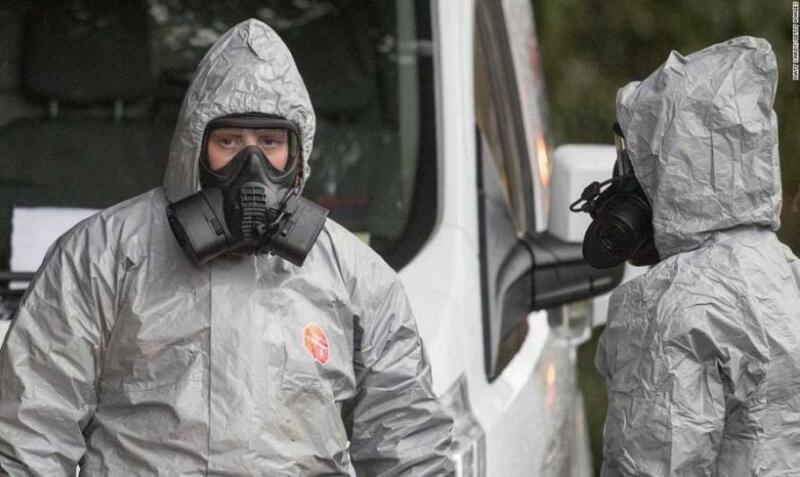 In the Skripal case, the journalists -who I can only hope are not as gullible as I am- behind all the ‘news’ have been told by ‘authorities’ that we’re dealing with A-234, which is a novichok nerve agent. Developed by Russia a long time ago, but no longer produced in Russia after 1993, as the 2013 Nobel Peace Prize winning Organisation for the Prohibition of Chemical Weapons (OPCW) has confirmed. Its chemical formula has been made public, which means that at least in theory anyone could produce it. Russia would seem to be the last country to try that, because it would point straight to them. And they haven’t stood still for 25 years, they can make Novichok 2.0 if they want. Not that they appear to have much if any reason to poison the Skripals, there are quite a few parties that have at least as much incentive to do that. Wait, before I forget, there was a policeman who allegedly ‘treated’ the Skripals first, and was himself ‘poisoned’ in the act and hospitalized, but was released a few days ago. What exactly happened to him? How did the A-234 not kill him? Did he receive such a faint trace that he was ‘cleaned’ within days? Where is he now? Why has he not released any statement? Doesn’t he strike you, too, as being a little bit pregnant? 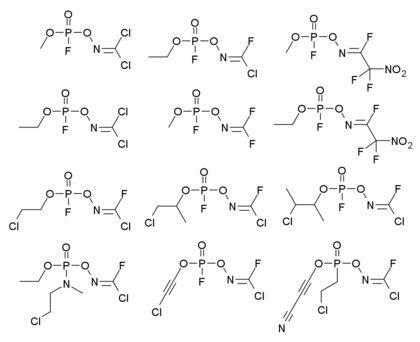 Hey organic chemists: the Novichuk nerve agents are like those below. [..] You could just use the racemate with plenty of effect. Unlike drugs, the goal here is to kill the recipient. From what I understand, A-234, like all novichoks, is just a pesticide with a fancy dress on. Not terribly unique or special, and not terribly Russian after 25 years either. Just terribly lethal. Which by the way is saying something about how we produce our food, too. Can we blame Putin for losing our insects as well, please? It’s so much easier that way. But I digress. As I started out saying, it’s the ‘news’ that yet another ‘location’ for the ‘nerve agent’ had been discovered after 25 days and hundreds of specialists, at the bleeping front door of the ‘victims’ home, as if nobody ever thought of looking there, that snapped that thingy in my head. Location, location, location. Still, when I venture beyond what can be or has been proven, which is about as near to zero Kelvin as I even want to think about, there was this other thing this morning. Julian Assange has been cut off from the internet by his gracious Ecuadorian hosts in their London embassy. And I betcha that’s because he dared question Britain in the Skripal case, on Twitter. Here’s my theory, borne off my gullibility in all its glory: Theresa May and her government have been stumbling from disaster to catastrophe over the Brexit calamity for months now, and they needed some relief. But they themselves are not smart enough to provide it. So someone got it for them. They’re keeping Labour boss Jeremy Corbyn occupied for all he’s worth with a cocked-up narrative of him being an antisemite. Stupid as can be story, but it works for as long as they need it to. The other day the BBC photoshopped a Russian hat on Corbyn’s face; that stuck less than the Jew-hater tale, so they went with that one. Some UK parliamentary fake news committee wants to talk to Zuckerberg, but they should look closer to home. If fake news is what they’re really after. So anyway, they all went with the Novichok concocted thing, and boy did that ever catch on. Even every western politicians’ pet hamsters have now sent their Russian caregivers packing. And you know what it is, even if May and Boris had any proof of Russian involvement, all those countries certainly do not. Even if they had the evidence, they’re not going to send it around to dozens of countries. Just not. Boris Johnson couldn’t resist comparing Putin to Hitler. You can’t fall any lower than that. Or can you? The diplomats were all expelled on a day that Russia was lamenting the death of 64(?) victims (mostly children) in a shopping mall fire, in what they declared a day of national mourning. You think Boris sent his condolences? I can write about this all day long, and weekends too. You know, Crimea, Ukraine, MH17, the new cold war narrative has been well prepared. And now John Bolton, who may well be the deadliest cartoon character we’ve ever seen -let alone imagined-, is all set to score the easy tip-in. But that is possible only because all of you are as gullible as I am. Don’t forget that. 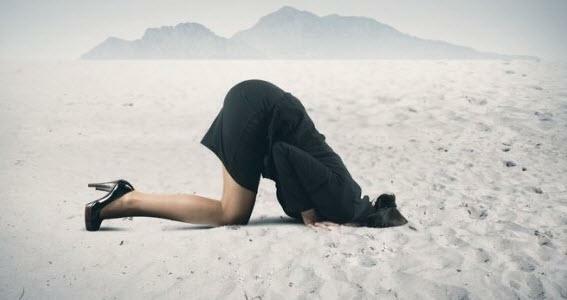 They’re blinding you with silence, with stupidity, with your own lack of neuron activity. Even if this is a story with too many holes in it to qualify as Swiss cheese. The story doesn’t make any sense? Who cares, really, all the front pages shout it out in bold print. And if you get tired of it: where’s the remote, Mildred? We know Facebook is trying to screw with your brains. Well, they’re not the only ones. Your government -and ‘intelligence’ services- want the monopoly on that, too. I can not make this a definitive, or final, or complete story. Because nobody can. But I can tell you this: if you think that Russia or God forbid Putin, ‘poisoned’ the Skripals, you’re so wrong you’re beyond salvation. Not because it may or may not be true, but because you have seen no evidence. And you still go with it. Where’s the remote, Mildred?